Water impermeability: up to a 10 m water column​. Shake the liquid component well before using. The powder component is added to the liquid component. 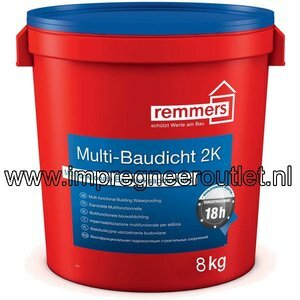 Remove material that adheres to the side of the bucket with a trowel and mix with a suitable mixing tool until homogeneous, lump-free and the proper consistence for application with a brush or filling knife has been achieved. Mixing time is approx. 3 minutes. 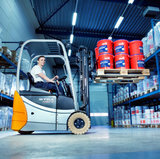 If required, smaller quantities can also be mixed in a ratio of 1 part by weight liquid to 1.36 parts by weight powder. The mixing ratio should not be changed. The subsequent working operations are executed as described under Applications in a brushing or filling procedure. The maximum total wet layer thickness should not exceed 5 mm. Do not use if the temperature of the air, substrate or building material is below +5 °C or above +30 °C. Relative humidity should not exceed 95%. Do not use in direct sunlight; observe the rules for the application of render according to the position the sun, remaining in the shade (pre-wet surfaces that are strongly heated) or work in the morning or evening hours. The waterproofing is sensitive to rain and frost in the fresh state. Thank you for your review. It will be shown on our website very soon. Please let us know when we can be of further support to you!